Fishing has been great over the past week or so. Plenty of quality around and some numbers too. Rain is forcast this week which will help the rivers and lakes along nicely. 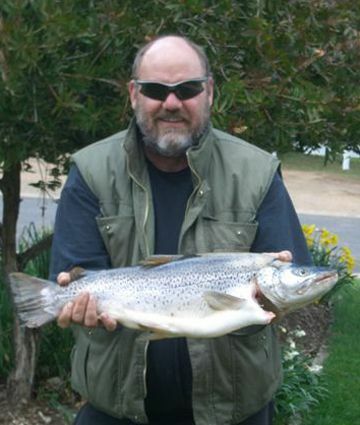 Rivers:- Good numbers of fish in the Eucumbene and Thredbo on the weekend with lots of fish caught and released. Globugs and Nymphs are the go in the Euc and Thredbo with some Tungsten Nymphs very handy to get down to the fish. Took Darcy up to the Eucumbene river for Saturday/Sunday, still enough fish in the river to keep you busy especially when you are an 8 year old and you haven't jagged a fish on a fly rod in flowing water before. Darcy thought they were turbo charged compared to lake fish. Though he got a little frustrated when I got a number of fish in a row in one run after he'd fished it. Comment was along the lines of "Dad, not another one, I'm going back to the car"
*Mick Patton had a good day out last week and managed some nice rainbows on nymphs. As well as the photos below you can check out some video footage he got as well on Youtube. Dry fly fishing has been improving with some good hatches of Caddis and fish taking emergers on warmer days. The Eastern streams are also holding good water and while there are not huge numbers some of the slower streams are holding a few fish. Lake Eucumbene:- Fly reports have been reasonable over the weekend . There were some caddis hatches on dark and some fish have been on snails and stick caddis in some areas. Lake Jindabyne:- Jindabyne reports have continued to be tough overall though there are still the odd good fish to be caught around the edges. Weather may play a big role too in how hungry and active the fish are but with the lake now at 73% and rising it looks amazing and the way it is shaping up the fishing will be as good as it was in late 2003. There have been a few brook trout being caught and make a nice by catch when fishing for a bigger brown. Midge are already on the wing and have multitplied dramatically in areas. It does not seem to be happening in a big way just yet, but watch this space. No reports this week. I would suggest it is well worth the look especially if you are fishing the Eucumbene river and want a break from catching river rainbows. *Rick from Rainbow Pines sent this photo through recently. Dan Andersen from Melbourne caught this 3.313kg (gilled and gutted) Brown trolling a Rapala in lake Eucumbene. Spent three nights up at Euc last week and had a good amount of success. Fished the Cobrabald bay area for a total of 96 fish, all rainbows. The majority of the fish came from the bank on powerbait, scrubbies and grubs. We also got a few trolling in the yaks and boats. Weather was almost perfect for the three nights and we couldn't have hoped for better conditions. Photo of a nice brown out of Jindy on Tuesday morning. Angler is Brian Burns from Adelaide, fish was caught flat lining a Ecogear SX40 in 8ft of water near submerged trees, on 2kg line. We have had our first delivery of mudeyes this week and hope to have a continuous supply for the season. Bait fishing has been outstanding again in Eucumbene this week. Powerbait has been the major slayer though scrubworms dipped in Ultrabite have been dynamite too. Best reports are coming from the Middillingbank arm and Seven Gates areas. 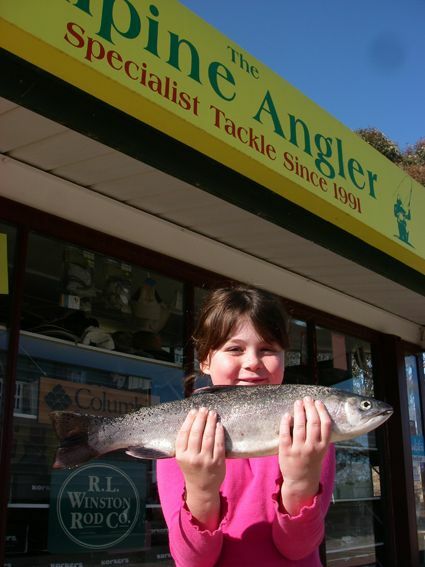 *Olivia Heise from Cooma caught this 870gm rainbow in the lake recently. It was one of ten others landed by herself and her dad. *I have attached pics of my kids, Daniel (10) & Jessica Csillag (7). Daniel is holding up the Rainbows he and I caught on saturday morning on the Thredbo River using glowbugs. Jessica is holding her first ever Brown Trout caught on Lake Jindabyne using mudeye's from our dam. Powerbait and Scrubbies have been excellent and mudeyes will come into their own soon.